As we inch closer to the official launch of the Mi Mix 2S, which is scheduled for March 27, new developments about the device have started to surface. Xiaomi itself has uploaded a new teaser today on Weibo, confirming that its much-awaited flagship device will feature wireless charging. 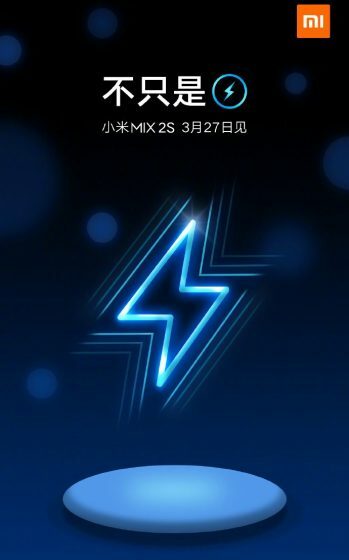 As you can see below, the teaser image includes the text that the Mi Mix 2 will ‘not just’ feature Quick Charging (as it appears from the electric charge logo) and includes a wireless charging pad at the bottom as well. This indicates that wireless charging is surely coming to the device and there’s no reason to doubt that. This teaser image falls in line with the plethora of leaks we’d seen concerning the Mi Mix 2S over the past couple of months. However, the inclusion of wireless charging on the Mi Mix 2S begs us the question about Xiaomi’s build material choices this time around. The company had used ceramic for past Mi Mix device launches, but since that cannot be used for wireless charging, the upcoming Xiaomi device will likely have a glass back. Now that Xiaomi has validated that the Mi Mix 2S will feature wireless charging, it makes this device the first from the Chinese giant to feature this charging technology. The only other specifications of the device that has been confirmed are that it’ll be backed by the latest Snapdragon 845 processor and use AI to finetune the photos you capture. In addition, it will still feature the stunning bezel-less display, but the front camera is now expected to be moved to the top. The leaked binaries of the Mi Mix 2S have also indicated that it’d bring along Sony IMX363 image sensor and 3,400mAh battery. So, what are your expectations from the Mi Mix 2S? Let us know in the comments below.